figure drawing done with .5 HB mechanical pencil on 3 ply bristol. my favorite combo! 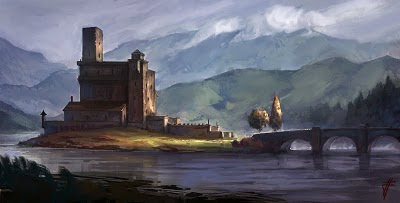 Inspired by the Eilean Donan Castle in Scotland. About an hour and a half on this one. 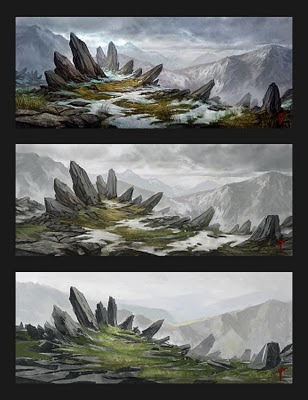 Process of the a typical environment painting. First, simple washes of value with lasso tool to create shape and composition. Second, further realizing the different elements (snow, rocks, etc.) and identifying the light source while preserving the simple shapes from the previous step. Overlay brush to create a palette. third, enhancing the detail and light source, adding atmosphere to show foreground middleground and background. Noodle in some details with texture brushes. Hello, my name is Jeremy Fenske and I'm currently a Concept Artist at High Moon Studios.